I cannot wait to watch this month unfold and embark on this wonderful journey with each of you! Many of you have probably gone over the details of the challenge, available on the studio's website at http://www.peacebankyoga.com/30daychallenge/, but I want to mention them here as well. Be sure to friend peacebank_yoga on Instagram and fill out the google form (link below) to receive your points. Your classes, events, and workshops will be tracked with Mind/Body online so definitely make sure you check into all the classes you attend. And finally, you will be able to see your progress on the challenge posters at the studio. We will try and update everything the day or two after we receive your points but please be patient with us, as there are many of you and we want to make sure we are accurate. On to the fun and inspiring part! The first day's pose is the grounding base for all standing poses and an energetic way to embrace each and every moment of 2018 with both strength and ease! We chose this pose to start because it is a wonderful way to ground, feel into your body and breath, find balance, create a base for all standing poses, turn inward and set your intention for the entire month. At the same time, we would like to set our intention. We intend for this challenge to be unforgettable and motivational. We intend to inspire, strengthen, cultivate mindfulness, spread kindness, move toward gratitude, and to come together as a community to Be the Change we want to see in this world. Our intention with this challenge is for each of you to Live simply, Dream Big, Be grateful, Share Love, Laugh often, and don't be afraid to challenge your body, mind, and spirit. As we embark on this journey together remember to trust your strength, take a deep breath, enjoy the moment and don’t be afraid to reach out to us or your fellow challengers for guidance and support. Tadasana, is one of those poses of perfect balance: strength and surrender, rooted and lifted, earth and sky. Sanskrit describes the perfect balance in a pose as a harmonious relationship between stability “Sthira” and comfort/sweetness “Sukha” in order to “resolutely abide in good space.” The balance of Sthira and Sukha can guide us not only in every pose we practice, but in every moment of every day. Let’s take Sthira, “to stand, to be firm, to take a stand” to remind us to stand in our own power, be strong, firm, steadfast, resolute and courageous. And balance it with Sukha “good space” to remind us to bring happy, light, easy, sweet, gentle, peaceful and virtuous qualities to each moment and thought. Can you stand tall, steady and strong like a mountain and at the same time stand in simplicity, beauty, ease and grace. This pose becomes the foundation of all our other standing poses and teaches us to breath and stand in our own power and use both Sthira and Sukha to harmonize our entire being, body, mind, and spirit. To find your strong sweet mountain, start from the feet up. Root down through the four corners of each foot and stay actively rooted in your feet. Keep a gentle micro bend in your knees, lift your thighs, and lift your pelvic floor. Hug your belly toward your spine, your front ribs toward your back ribs, a slight lift of your heart, and allow your shoulder blades to wrap back and down. Active through your arms and palms and extended through your fingers toward the earth. Lengthen the back of your neck (slight tuck of your chin toward your chest) and lift the crown of your head to the sky. Take full and deep breaths to fill the belly, ribs, and chest. Find a soft steady gaze and be ready to face each challenge from your place of strength and grace. You can take Tadasana with your feet hips distance or with your big toes touching with a slight space between your heels. Extended Mountain with the arms up or palms at the heart center for another few variations. Invite yourself to get outside today, admire a mountain, ask a friend to join you on a walk/hike or a coffee/tea to catch up, or just take a deep easy breath rooted into the earth and lifted toward the bright blue sky. This month will be a combination of our peacebank yoga instructors and staff in the poses, and a few of our favorite pictures from the past three years. We will do our best to offer a few variations to each of the poses so you can cater the challenge to your own practice. We invite you to get creative and take your photos with friends in the studio, as this gives you the full 5 points. If you do take your photos outside of the studio, try them out in nature, with loved ones, with pets, in new adventurous locations, and connect with fellow challengers to help take your photos! Sending tons of gratitude to all of you and hope to see you on the mat today, Monday Jan 1st to kick off the challenge and the year together. How wonderful would it be to start your every day with grounding into your body, a quiet moment to focus your breath, a chance to center your thoughts toward gratitude and set an intention for the day, and offer a humble bow/hug toward the earth. Child’s pose is just that! Some of you may know that I am expecting my first child and I must say, I have never used Child’s pose so often in my days and in my practice than I have over the last 8 months. In the beginning, due to fatigue, my practice was just Child’s pose. After teaching all day, this space was a chance for me to turn in and re-energize. After feeling tired for the first few weeks, I hit a stride of energy, but had to work through some low back pain and discomfort…once again, my best friend was Child’s pose! Now as I find myself in the final stretch of the last few weeks, this pose is needed more than ever. My husband has also been a pillar of support and strength during the last few months, but after our puppy ate chocolate (she is ok, thank goodness), he helped me paint at the studio, moved a car full of supplies, cooked dinner, and cleaned the house...he too collapsed into this pose to revive, reenergize, and recuperate from the day!!! What an incredible gift this pose gives each of us. It welcomes with open arms, without judgment, and lets us stay as long as we need. I am forever grateful for this pose of wisdom, slowing down, grounding, and support. Needless to say, this will be the first pose I teach our little one when the time for tantrums arrives. As I think of this special pose of support and this prayer of gratitude from our quote today, it seems the perfect chance to remind all of us to truly thank someone special in your life today. Out of the blue, not after they have helped you, but think of one (or more) special people in your life that you are thankful for and let them know it. It will make their day, and probably yours too. We introduce this pose early in the Challenge, as it is your best friend when practicing yoga everyday! It gently stretches your hips, thighs, low back, and ankles. It calms the brain and helps relieve stress and fatigue. It relieves back and neck pain when done with the head and torso supported. This pose activates the parasympathetic nervous system (system of rest and digest) and relaxes the body in the same way a cat nap does…And who doesn’t need a quick reset? There are a few variations: we will start with the extended child’s pose. Kneel on the floor. Bring your knees out wider than your hips with your big toes together to touch (toes are un-tucked). Sit your hips toward your heels, exhale and lay your torso down between your thighs. Walk your arms forward and rest your forearms and palms to the Earth. Take a few deep breaths, filling your low back, back ribs, and back of your heart. Let your forehead rest on the mat/earth. ~ Traditional child’s pose: knees are hip distance, torso rests on top of the thighs, arms settle along side of the hips with the palms up, and the chin slightly tucks toward your chest. ~ For any knee pain in this pose, roll a blanket and place it between your calves and hamstrings (right behind and above the knee) to help create space. Feel free to also use a blanket under your knees. Bridge pose and all its variations make it a superpose! 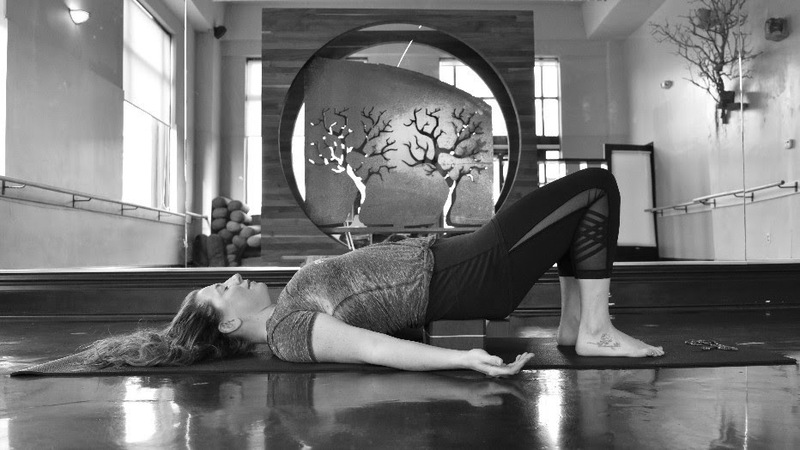 To start, I love a dynamic bridge to awaken the movement of the spine, lubricate the shoulders, turn on the stable core, counter balance all the rounding/hunching of the shoulders, and link the body with the breath. From there, finding stillness in the traditional shape (shown in picture above) brings the chance to energize, open, and breathe into the heart. However, a supported bridge on a block (see picture below) is as close to yoga dessert as you can get! All variations of this bridge pose can relieve back pain, give the heart muscle a gentle rest, open the chest and front of the shoulders, and allow the flow of energy and breath to rise up. It is calming for the mind and opening for the heart. When I began my yoga journey I could not do enough chaturangas, arm balances, inversions, and deep back bends. Through the wisdom of this ancient practice, I have learned how to slow down. I now look forward to the support, the still, the calm, and the breath found in each and every pose. The incredible Rumi quote above reminds us that very little within us can evolve and grow when we are stiff and rigid; the growth happens once we choose to crumble, to let go, and to break down. When we are soft and open to the magic, flowers grow. Yoga is all about balance. In a society centered around our To Dos, our successes, and our need to accomplish many things in one day, we find what we truly need from our practice is to turn into the body and out of the mind. We need to balance this busy stressful energy with opportunities to get steady and still, to practice with an easy joy, and to embrace the sweetness of support. Maybe start your day asking how you can support yourself today, or help support someone else in need. Through an act of kindness, a simple deep breath, a smile shared with a stranger, or the choice to take the supported pose in your practice. Bridge: Interlace the fingers underneath your back and hug the palms and wrists toward each other. Root the back of your shoulders and arms into the earth and use those roots to lift the hips and send the heart toward your chin. Stay, breathe, and embrace the wonder of opening the heart. Dynamic Bridge: Palms start alongside the hips. On your inhale, lift the hips and float the arms up over head. On the exhale lower the palms and lower the spine one vertebra at a time to the floor. It should be a meditation in motion with the spine, arms and breath moving as one. Supported Bridge: Slide your yoga block (or a thick book covered with a blanket, or rolled blanket/towel) under your sacrum, right above your tailbone and below your low back. You should feel the base of your spine lifted and supported; this should feel amazing and with no strain to your lower back. You can choose your arm position, palms up, cactus arms, or overhead. Stay here for as long as you like! To come out, root through the four corners of each foot to lift your hips, remove the interlace of your hands or your block and lower down one vertebra at a time. Let your knees sway left and right to neutralize your spine. Maybe using a gentle reclined twist as a counter pose. Living in a time and place where there is constant movement, chaos, stress and expectations, finding a sense of peace can feel impossible. Most of us yogis are not able to escape to a quiet mountaintop and live without the chaos and turbulence; we must find a way to cultivate this peace amongst the noise and chatter. When I first began a meditation practice, I was obsessed with finding the quiet and perfect location to travel inward. The moment I would settle, the phone would ring, a horn would honk, the dogs would bark, a car alarm would go off and it seemed that the world was doing everything it could to “take away” my peaceful moment. After a few years of fighting meditation, I learned to let go and cultivate the quiet from within, starting this practice with a focus on my breath. I learned to embrace the noise and use it to continue to dive further into my own peace. I found that I could be a part of the noise and the chaos and no longer need to fight it, as it is apart of me and this beautiful community I am grateful for. Flipping a perspective and thinking that the phone might be someone calling to share a funny story, the horn honking to prevent an accident, the dogs barking with excitement for their morning walk, a car alarm going off for a neighbor that slept through their phone alarm making them on time for work, changed everything. Starting from table top, take your hands one step forward, tuck your toes and lift your knees and hips. As you lift your tail and release your heels toward the mat, send your chest toward your thighs. Align your feet hips distance, your wrists parallel with the top of your mat and shoulder width apart. Send your inner thighs back behind you, engage your belly toward your spine and your front ribs to your back ribs. Root into your index finger and thumb and wrap your shoulder blades back and down your body, let your head and neck fully release so your gaze is between the feet/knees/thighs. Modifications can include Downward facing puppy pose or dolphin on the forearms. Take deep and full breaths and repeat often. As the 30 day challenge kicks off, I wanted to say thank you to Peacebank Yoga, and to the wonderful people I met through their warm community. Back in December of 2016, I was walking along Broadway after grabbing a bite with my wife, when we stumbled upon Peacebank Yoga. We had recently moved to Redwood City, and although we liked the area, I didn’t yet have the sense of community like I did in my old neighborhood in San Francisco. I saw the sign on the sidewalk for the “30 day challenge” and Setareh was kind and walked outside, explained the challenge to me, and inspired me to sign up. I was hesitant because my wife Sandra and I were busy preparing our house for our new (first) baby who would arrive in a few months. Luckily for me, Sandra recognized the many benefits of me attending yoga frequently, and encouraged me to join. For 30 days, I went to every class I possibly could. My wife Sandra asked me if I came straight from the airport to the yoga studio one day, and she laughed when I admitted that I had. In addition to Sandra being supportive of me, she also attended Veronica’s prenatal yoga classes. That’s another story for another time, but I’m convinced that one of the reasons the delivery went so smoothly is due (no pun intended) to the time that Sandra spent in Veronica’s supportive and amazing class. Veronica, as many of you know, is simply a wonderful human. I’ve appreciated the smiles, encouragement, and inspiration from other teachers, and all around wonderful humans, too. I’ve been fortunate enough to get to chat with Setareh, Emily, Robin, Nina, and some others over the past year. I marvel at their artful talent of bringing out the best within people. They’re real people who simultaneously inspire me and put me at ease. This sounds like a yoga lesson of it’s own, of both working hard and relaxing, and I suppose that wouldn’t be far off. These lessons from yoga have subtly found their way into my technical profession and allowed me to do my job of teaching other airline pilots (talk about a type A personalities) in a more meaningful way. Peacebank has perhaps most helped me with an improved sense of balance and community, much more than just the 30 days of January, 2017. While it was fun to give it my all for a month, part of my journey came with not being attached to the “type A” winning outcome I have mistakenly clung on to for some life occasions. By the end of the 30 days, I was so sore (in a good way) and so relaxed, that I really didn’t care about the outcome of the challenge any longer. I knew that come February 1st, I would sleep in and take a break from yoga. I could feel successful and at peace with having tried my best at a practice that doesn’t even have outer markers of success. Inside I could tell the difference though, and I won’t even attempt to summarize it. Perhaps it’s different for each of us. The 30 challenge’s “daily gratitude and act of kindness” made me happy and I was touched that a business would include this in their mission. I imagined the many kind acts emanating outwards from this studio as ripples into our community, like the movie Pay it Forward. Sandra encouraged me to keep those practices going forward all year long, and although I wasn’t necessarily as disciplined as jotting it down daily, the acts turned into a habit and I just about always made the effort to do a kind act and have an element of gratitude. This is a contagious habit that I am extremely grateful for. To the kind, patient, and wise teachers of Peacebank, thank you for being so good to us and sharing your passion! To those participating in the 30 day challenge, good luck! Remember that even if you win, you may just have already won prior to the end of the contest:) I hope that the month and year ahead are meaningful and joyous for you, and that you find the community and inspiration I have been so fortunate to feel in this past year of attending classes and interacting with great people. Camel is a great pose to open your heart to the next few weeks of the challenge! To start, align the knees under the hips and tuck all ten toes. As you bring your hands to your low back engage the shoulder blades and elbows toward each other. Most important in this pose is to engage the inner thighs, hug the belly toward the spine, front ribs to back ribs, and use all of this to support a lift of the heart. Keep the hips stacked on top of the knees and lift the heart toward the sky. If it feels right for you the heart and shoulders can then begin to reach back. All variations are done with full breath. If you find you can no longer breathe, you may have gone too far. Be gentle and use the breath to expand and burst open your heart! Inhale the present, exhale the past! What are you still holding onto from 2017 that no longer serves you? Forward bends are our opportunity and reminder to let go, release what we need to let go of in body, mind and spirit. They are an opportunity to go deeper and be introspective. They are an opportunity to calm and soothe your mind. Change is not always easy and is often scary. We often cling to the things we know and the habits we have created. This reminder of letting go asks us to examine the things we are holding onto that no longer bring lightness to our being. In your forward fold today maybe ask yourself what it is you are ready to release, what is weighing you down, and imagine with each exhale the burden, the weight releasing from your body mind and spirit. A calming posture that lengthens the hamstrings, decompresses the spine, and activates the inner legs and quadriceps. To begin, stand in Mountain Pose, hands on hips. Exhale and bend your knees slightly as you fold forward from the hip joints, not from the waist with the belly engaged. As you descend, continue to draw the shoulders away from the hips to bring length. As in all the forward bends, there is a gentle hugging of the belly toward the spine and an intense sending of the inner thighs back behind you. Stay long throughout your neck, extending the crown of your head toward the ground with a slight draw of your chin to your chest. Draw your shoulders down your back. Bend your knees a little (or a lot) to avoid straining your back if the hamstrings are tight. Press the heels firmly into the floor and lift the sitting bones toward the ceiling. Turn the top thighs slightly inward. If possible, with your knees straight (not locked), bring your palms or finger tips to the floor slightly in front of or beside your feet, or bring your palms to the backs of your ankles. If this isn't happening today, no worries cross your forearms and hold your elbows or bring hands to blocks or shins. Ensure you do not have any rounding in your upper back and the your shoulders are not rounding forward. With each inhalation in the pose, lift and lengthen the front torso just slightly; with each exhalation release a little more fully into the forward bend. In this way, the torso oscillates almost imperceptibly with the breath. Let your head hang from the root of the neck, which is deep in the upper back, between the shoulder blades. You can shake the head yes & no gently to aide in the release. To come out of the pose, either keep a deep bend in the knees, intensely engage the belly and round roll stack one vertebra at a time to slowly come to stand back in Tadasana, Mountain pose. Or, engage the belly and keep length in the spine as you inhale with a flat back reversing the swan dive down. The studio itself has gone through an organic changing spree, and we are feeling really great about the Sun studio and your enthusiasm about the new classes! Improvements are still on the way as we continue to align our space with the yoga values we all work to live by. Many of us come to the yoga mat and start with the asanas, the poses and it may not be until years later that we learn about the values and building blocks of this practice. There are two very important foundation roots of yoga before we get to the poses. The first two limbs in Pantanjali’s Eight Fold Path of Yoga are the Yamas & the Niyamas: the ethical and moral codes of the practice. They are a map to guide you on your life’s journey. The Yamas teach us what “not to do” and the Niyamas teach us what “to do.” Together they form a moral conduct. The asanas (postures) are often the focus in yoga practice but yoga is so much more, and incorporating the Yamas and Niyamas into your practice may just be the key to transformation on and off the mat in this new year! It is often easy to practice nonviolence in a big way, but we invite you today to notice the small repetitive violence that often lives in our thoughts. Are they negative or judgmental? We are so hard on ourselves and often forget to realize that every thought leaves an impression, especially violent thoughts of negative self-image and judgments of our actions. Just bringing awareness to these thoughts is an incredible first step. Find yourself today being truthful to what serves you best. Maybe it’s a yoga class, a walk outside, cozying up with a book, or taking a nap. I have always struggled with arriving on time and ending on time. We often steal other people’s time when we do this. Give yourself a few extra minutes to arrive someplace early this week! Take a look at what you might be over indulging in right now, and make a small intention to pull back. A most wonderful and wise Intention and Mantra for the day. Practice for one day this week being content with everything around and within you. You are already doing this one by getting to yoga! Maybe also adding in an extra note of discipline with your resolution or intentions for this year. If you’ve made it this far into the email, your already engaged in this. J Maybe also join our book club (first meeting Jan 24) and dive into the Four agreements to keep your inner practice going strong. Let go of the need to control, judge, or do things right. Find the sweetness, the Sukha! Low Lunge! This pose can be deceptive. It can be quite challenging and demands balance, strength & flexibility in the legs, hips and groin. When you are met with challenge on your mat (and in life) it is important to practice Ahimsa, breathe through it, and let go so we can release and soften into the pose. Ishvara Pranidhana! Low Lunge is a great pose to stretch out tight quadriceps, hamstrings, groin and hips, and encourages a full range of motion in the lower body. As such, this pose is perfect for athletes such as runners and cyclists, as well as those who sit at desks all day. Depending on which variation you take, it can also create a wonderful opening sensation in the chest and abdomen. From tabletop/ hands and knees step your right foot forward between your hands, aligning the right knee over the heel. Keeping the right knee fixed in place by rooting into your inner ball of the foot, slide the left knee back until you feel a comfortable stretch in the left front thigh and groin. Find a balance of strength and flexibility in this pose as you scissor/squeeze the legs toward each other while sinking deeper into the length of your left hip. Finger tips can stay down to assist, a block under the hands, finding more balance by bringing your hands to your top thigh, or reaching through the side body as the arms rise to the sky! Draw the tailbone down toward the floor, continue to stitch in at your inner thighs and belly, and lift your pubic bone toward your navel. Lift your chest from the firmness of your shoulder blades against the back torso. Relax your shoulders down away from the ears. Remember to come out of the pose just as mindfully as you go into it. If this pose irritates the knee, pad the knees with a blanket or take High Lunge with the back knee lifted off the floor.